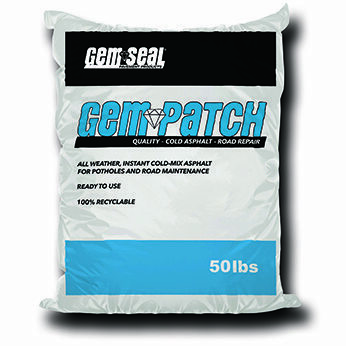 A quality, cold-asphalt road repair, GemPatch provides an instant repair that can be immediately trafficked. It is easy to use, has a minimum shelf life of 6 months, and is durable against harsh weather conditions. GemPatch can be used on asphalt and concrete surfaces. Pour a 2″ layer of loose GemPatch into the area to be patched. Level the loose material and then compact to a 1″ layer. Compact with a tamper or a 4 inch x 4 inch post. Place and compact additional layers until desired thickness is achieved.